I have developed an obsession for pyrex mixing bowls. Why? Well, one time when Guy and I were moving to a new home and he dropped and broke a pink pyrex mixing bowl I inherited from Elavine Eck. Now Elavine was my Dad's (Gary's) daycare lady growing up. Grandma MaryAnn was a full time teacher and a single Mom so someone had to take care of Vicki and Gary as kids. Elavine was there and she became our "Aunt Venie" who actually was no blood relation to us at all. At Ancestry.com it showed that our Venie had a sister who lived with her until they were in their late 20's and both Venie's parents were from Sweden. Venie was a piano teacher by trade and lived on such a low income but she was very well-loved. Janis and I used to stay at Venie's house on New Year's eve when we were up north so everyone else could go out and party...of course we just thought it was fun. Venie gave is "ice milk" treats and showed us around her ancient brownstone near downtown Duluth with all of her antiques. Then she would play show tunes for us and we would dance around in our nightgowns. It was a blast for young kids like us. Well, when Guy broke that pink pyrex bowl (it was in a set) I researched replacing it and found it was from the 1930's! Who knew? - it was also only part of a larger set that included salt and pepper shakers and all manner of pink glass accessories. I was on the hunt immediately. Guy bought me a replacement almost immediately - bless his heart. Oh Boy, I remember watching Venie mix up her famous Swedish "spritz"cookies in that bowl. As it dawned on me that Venie had that mixing bowl for over 50 years - I realized that bowl had some of Venie's life force in it. She was famous for her "spritz"cookies and her parents were from Sweden so they must have been authentic. She must have gotten that set when her sister was still alive and they lived together (according to the 1930 Duluth census). She was a gentle spirit and I always enjoyed when she laughed and her nose would push up her glasses. 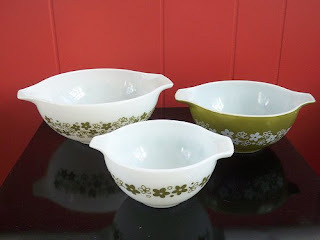 During my search, I found other pyrex bowls along the way that reminded me so much of my childhood - both Vicki, Grandma and Mom had sets like the ones above. How many tuna ring pasta salads did they hold out at the cabin? What about pea/cheese salads at Easter? How many lemon bars were whipped up in them or jello for molds at all our fine Minnesota family events. I realize that people outside of Minnesota maybe cringing but 'tuna ring pasta salads' and 'jello molds' were the rage here for decades. One bite brings me back to my youth and to the laughter at family gatherings. You can see why having these bowls in my home is so important - they may not be stylish but they make me feel like I'm continuing the narrative thread of life in Minnesota. When I'm mixing up banana bread in the darned things, I see 3 generations before me doing the same thing and it feels like home.